Duct tape has been around for as long as I remember. But the colors and patterns that are available now is a far cry from the boring silvery-grey tape that has become a staple in people’s homes. It’s no wonder that duct tape crafts have become popular in the world of kids crafts. 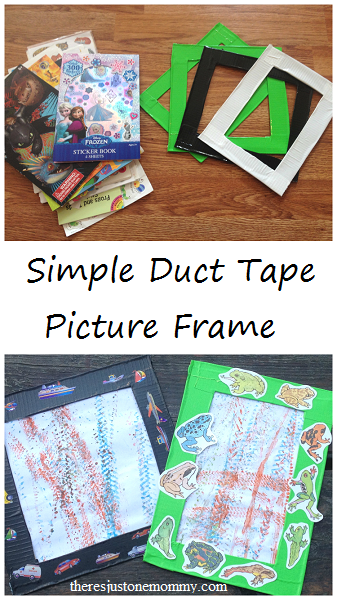 This simple duct tape picture frame is perfect for displaying your child’s latest artwork. See the pictures in the frames above? Those pictures are the result of painting with toy trucks. 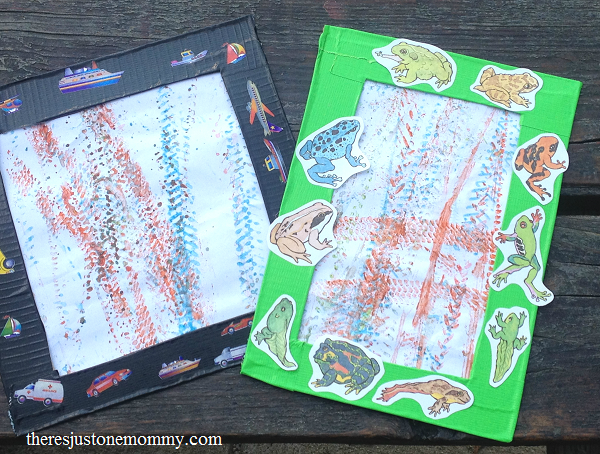 We decided this simple duct tape craft was the perfect finishing touch to the brightly colored artwork. Empty cereal boxes work great for this duct tape craft. The cardboard is thin and easy for kids to cut on their own. It’s okay if the cuts are perfectly straight. The tape will cover many of the flaws, and your child will be working on important scissors skills. Cover the cardboard with your choice of duct tape. If you have duct tape with some cute patterns, you may want to stop there. If you only have solid color tape, your child may want to decorate the frame a bit with stickers. Since we only had solid colored duct tape on hand, we decided to decorate the frames a bit using stickers and permanent markers. 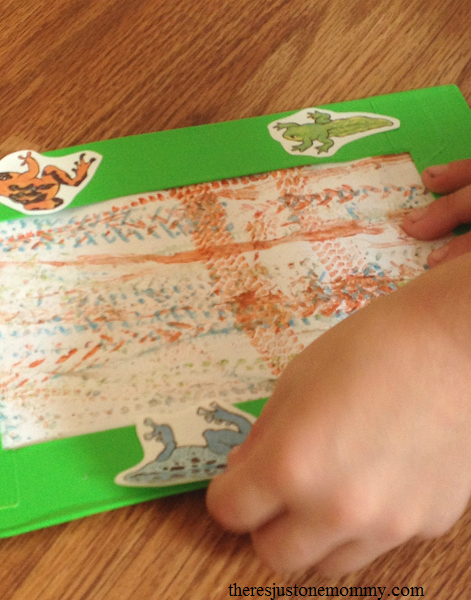 Stickers are a fun way for kids to work on fine motor skills while crafting! Your child will be proud of his/her new picture frame made with duct tape. These frames are pieces of art themselves. 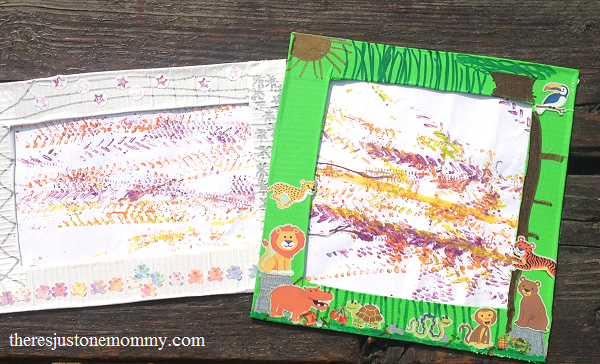 Plus, kids love displaying their artwork in their very own homemade picture frames. 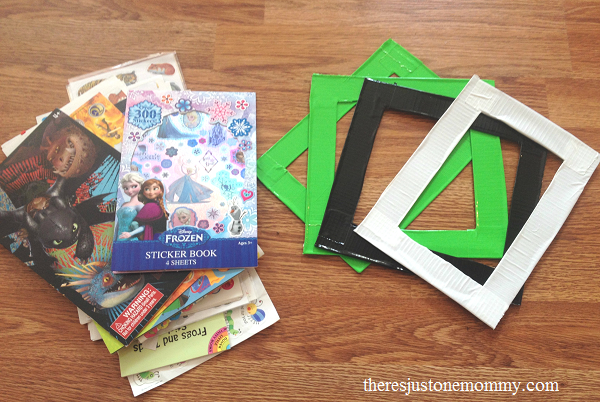 I love simple to create and inexpensive kids activities! This is a great one. So easy to personalize and multiple ages can do at once. Awesome! Simple and inexpensive are two things I look for in an activity. This is definitely something multiple ages can work on. My daughter had fun using permanent markers to design her frame; my younger son chose to use just stickers. I could definitely see an older child getting even more involved in the design. Thank you for stopping by the Thoughtful Spot Weekly Blog Hop and sharing your fun activity craft with all of us! Have a wonderful weekend and I hope to see you on Monday again!